VIBES Music Festival was packed with incredible performers. Flower inspiration for the Wild Walls. Coordinator Izzy helps set up for the festival. Rhys raps on the main stage. The lovely ladies of Berries N' Juices sold homemade beauty products. Moisturizing oil from Berries N' Juices. With Izzy, Derrick is part of the VIBES Management Team. 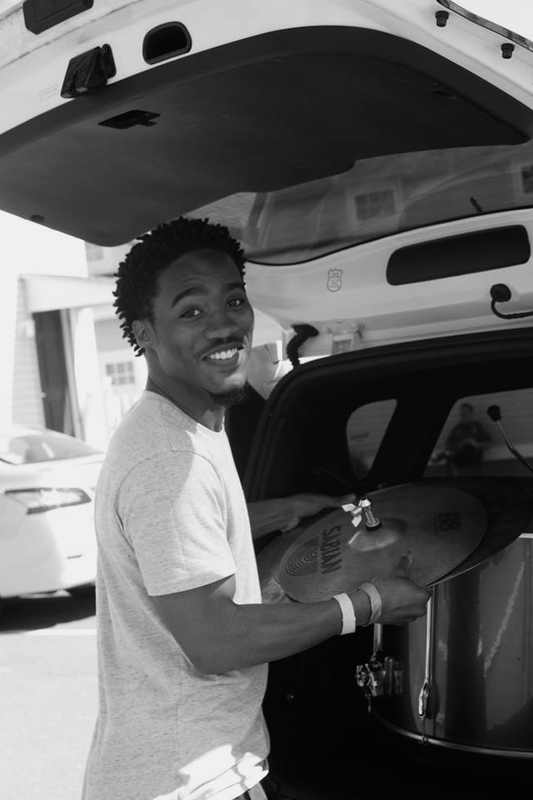 In early May, Loam was lucky enough to be a part of the VIBES Music Festival, a large-scale music and arts festival organized by Ismael Coleman and Derrick Holman. This powerhouse duo collaborated with a crew of incredible environmentalists, musicians, artisans, and advocates to create a day rich with good music and good vibes. We spoke to Derrick about VIBES' vision and the ways in which creativity and sustainability can coexist. Get inspired and take note: VIBES is growing up and out. "We want to lead by example and show people that you absolutely can do well by doing good." (1) How did you get interested in music? In sustainability? Music has always been important to us. We both grew up in musical households in some respect. Being raised in Memphis, which has a hugely influential music scene, growing up as the cousin of blues legend B.B. King, and living with a father who works as a professional DJ, Ismael's always been a musically inspired person and it shows in his passion not only for music but for the musicians and artists who facilitate its creation. As a kid, both my parents were (and still are) huge music fans. My dad used to take us on family trips where we would drive from our home in New York to visit family in Florida or Atlanta or D.C. and the whole way he'd play us his favorite albums all the way through, sometimes over and over again. That gave me an appreciation for the actual art of creating and after hearing someone tell their own story from start to finish on a record and recognizing the energy that goes into that process, it made me realize how personal music is, which is what I love most about it. The idea of sustainability came along a bit later but after seeing how closely and similarly issues of sustainability affected both our communities, despite how far apart they are, we realized it was something important for us to address and that while we have the opportunity to create change, it is our responsibility to our community to do so. (2) What inspired you both to meld these two interests through the VIBES music festival? We were first inspired by educating ourselves about sustainability and, though we had pretty extensive experience with live events, concerts and various elements of project development, we were originally planning to do something more media and content based. As we were working on structuring ourselves around that goal, a mentor and good friend of mine was working with a similar festival called the Broccoli City Festival that was a major inspiration for VIBES. It made a lot of sense to us, considering our backgrounds, to create an experience-based event and we saw the positive impact that they were making with it so we wanted to build and expand upon it. We started tapping our own networks and developing an idea for what it could look like on a college campus and we came up with VIBES. (3) How did you generate the idea for VIBES and what did you need to do to carry out your vision? Who were your primary collaborators? What lessons did you learn from the experience? Most of the vision for the festival was carried out in about 2 months which might seem like a fairly reasonable amount of time on the surface, but over the course of that time alone we were able to secure in the tens of thousands of dollars from both corporate and university sponsors, execute a related overnight trip with fifty college students over 500 miles away from our campus, and coordinate with several dozen campus groups and university departments and offices - including the President's office - so it was a pretty major production to carry out in such a short time. We got support from so many places and I attribute most of the success we had to the power of authenticity. People understood that we really cared about this and were willing to sacrifice our own time and wellbeing to do something important for the community and they were willing to be a part of that and make sacrifices as well. We have to give a major shoutout to Bozoma St. John who works at Apple for making a lot of really dope elements possible, as well as Jennifer Kleindeinst who was our sustainability advisor and just an all around great person. And also a big shoutout to the countless people who supported and were a part of it in various fashions. Everyone was and is important. (4) What is your plan for VIBES moving forward? What are your personal goals, both individually and collectively? Our primary goal is to keep serving our communities and to develop ourselves into a social enterprise that makes it easier for other people to do the same. We believe doing the right thing and making a positive impact doesn't have to come at the cost of personal gain or individual success. People who have no interest in doing good try to dissuade others from the idea that traditional notions of success can be both shared and beneficial to all. They want people to think that in order to be "successful" you have to do whatever it takes, even if that means betraying your local and global community to do so. We want to lead by example and show people that you absolutely can do well by doing good.